Redshirt freshman Gianna Haugen competes during the Aztecs meet with San Diego on April 20 at the Aztec Aquaplex. San Diego State Swim & Dive enjoyed fun-spirited competition against the University of San Diego on April 20 at the Aztec Aquaplex. The Aztecs competed against the Toreros in numerous heat events, including freestyle, butterfly, backstroke and breaststroke. Times were kept, but final results were not posted. Additionally, seniors who were part of the 2017-18 team did not participate in the event. The meet was a friendly before the start of the long-course season, which SDSU will use to prepare for their 2018-19 campaign. Competitions held during the long-course season are held in 50 meter pools; however, pools are regulated to 25 yards during the collegiate season. Head coach Mike Shrader said that the meet was a good opportunity for the Aztecs to prepare for the long-course season. “With our sport, it’s year-round, so all these kids train with clubs in the summertime. This is a good time to get ready for the long-course season and keep everybody going,” Shrader said. 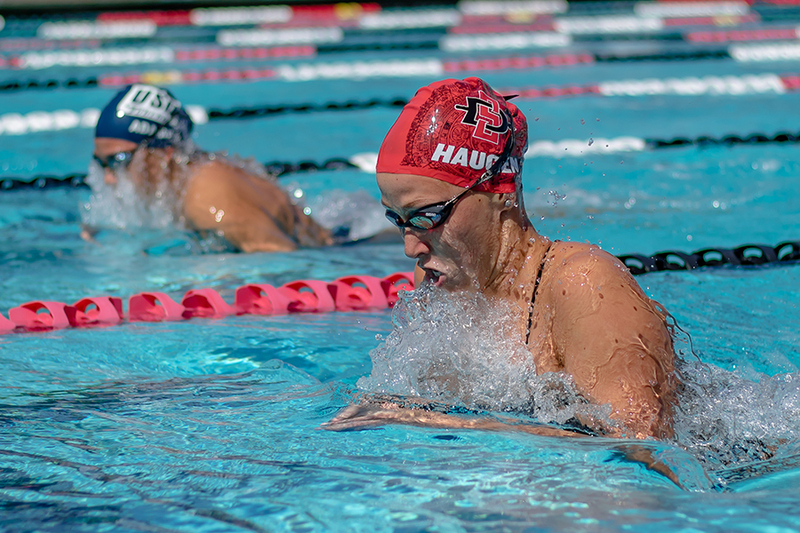 Junior swimmers Anna Stahlak and Rachael Kelch — the lone seniors for SDSU next season — were showcased, and Shrader praised both athletes following the meet. “(Stahlak and Kelch) did a really nice job today. They both competed really well and they were really good leaders for us today,” Shrader said. The meet included a 200 meter mystery relay, where two swimmers from SDSU and USD were randomly paired up and assigned to compete in a lane. Before the relay, swimmers were given time to select their individual styles of swimming and plan the order of swimmers. Kelch said that the mystery relay added a competitive yet fun aspect to the meet. Although mystery relays are not conventional, Stahlak said that the relay was welcome among the athletes that competed. “Everybody’s here to have fun, but it’s competitive too, so it’s fun to mix things up for once instead of it being so strict event-wise. I think everybody enjoyed that, to say the least,” Stahlak said. Stahlak said that the Aztecs had a strong showing after recently competing at the Arena Pro Swim Series at Mesa in Mesa, Arizona from April 12-14. “I think we performed pretty dang well because most of our team just came from a big meet, but we kind of got right back into training 20 hours,” Stahlak said. Shrader said that the team performed well despite training before the meet. Kelch said that her team was successful in the meet because of teamwork, not individual accomplishments. “As a team, we work together, and there’s no really one individual because each of us makes the other one better in the water,” Kelch said. The Aztecs will continue their long-course season throughout the summer in preparation for the collegiate season, which begins this fall.